Workshops are available in sizes up to 64 feet wide with 40' clear span. Interior leg heights up to 12'. 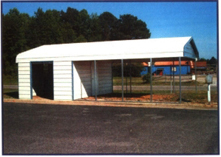 These custom built, certified metal buildings can be open clean span or have interior walls. 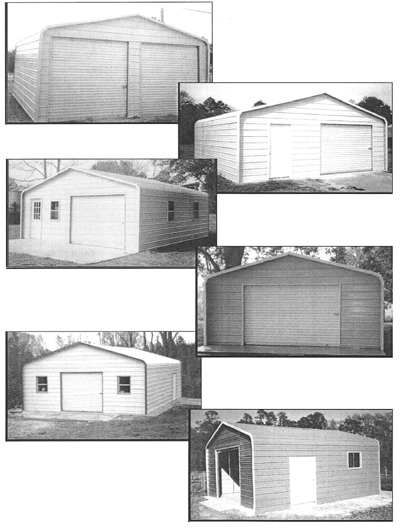 You may chose from classic carport style eves, or A-frame style boxed eves. Rollup Doors, Windows, and Walk-through Doors are available. Above prices include one 48" door and one 8 X 6 rollup door. 30' and 40' workshops are available; Call for pricing. Other sizes are available, call or request quote online with the feedback form. Prices listed here do include enclosing sides or ends. Other Leg heights are available; call or request quote online with the feedback form. 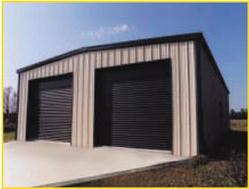 Pressure Treated Sectional Buildings Our Trent pressure treated timber heavy duty workshops and sectional buildings relieve you of the annual re-treating of your timber workshop and sheds. Using tanalised pressure treated timber these are high quality timber buildings and have strength and style. Click here to find a dealer or affiliate near you.